5 Non-Beatles Songs Produced By George Martin. Beatles Radio: The Beatles, Solos, Covers, Birthdays, News The Fab 4 and More! 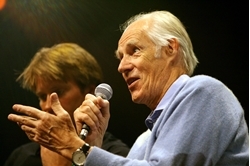 Legendary producer Sir George Martin would’ve turned 91 today (January 3), and while he is best known for his work with The Beatles, Martin worked with countless other artists in his incredible career. Here’s a five non-Beatles track sampling of from his astounding career. Okay…this one involves a Beatles, but it still counts, especially since MJ is included and the track was a massive hit off of Sir Paul’s 1983 album Pipes Of Peace. One of the very few acts that received Martin’s producing touch during the time of Beatlemania, Gerry and the Pacemakers’s scored their biggest U.S. hit with “Don’t Let the Sun Catch You Crying” in 1964. Once The Beatles called it quits in 1970, this opened up more time for Martin to work with other acts, and one of the most notable were America, whose biggest Martin-produced hit came in 1974 with “Tin Man,” which peaked on the Billboard Hot 100 at number four. Perhaps the biggest success of Martin’s producing career, Elton John’s tribute to the late Princess Diana has sold over 33 million copies worldwide and was number one on the Billboard Hot 100 for a staggering 14 week. It remains the best-selling single in the history of Billboard, which is likely a feat that won’t be matched or topped ever.